It's no secret that I'm a pretty big proponent of weeding books in the public library... and in our own private lives as well! My own hoarder-ish tendencies cost me most of my book collection when the books I had in storage succumbed to a flood. (I promise you, my greed for ARCs has abated in the meantime.) Since then, I've made a (mostly successful) rule that everything has to fit on ONE bookcase. If I want more books, then I've got to figure out which ones I'm going to have to get rid of. 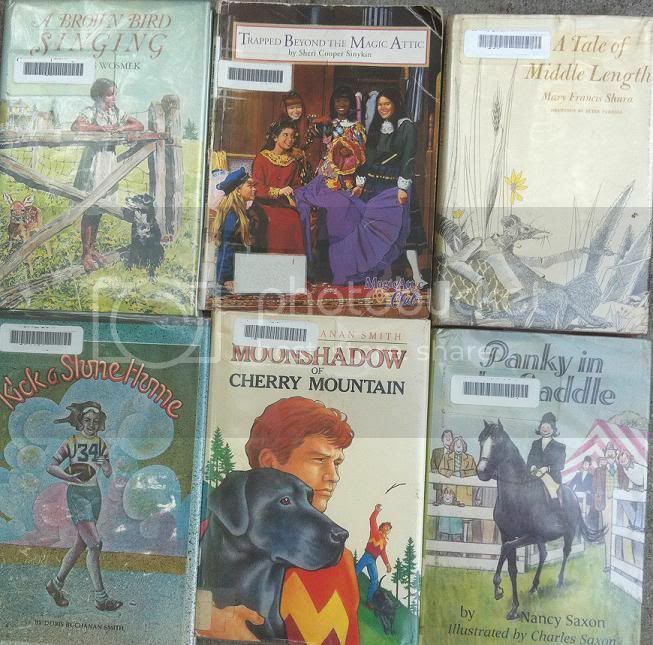 With that in mind, I decided to take a critical look at our juvenile fiction, and found a few candidates for weeding. Most of these I'd weed on condition alone: yellowed, falling out pages, broken spines, scribble marks, scuff marks or worse on the cover. Not to mention dated topics and outmoded, unappealing covers. Most of these books have been in the library since 1989 or earlier, and have NEVER been checked out, not even once. Here's my selection for this week. 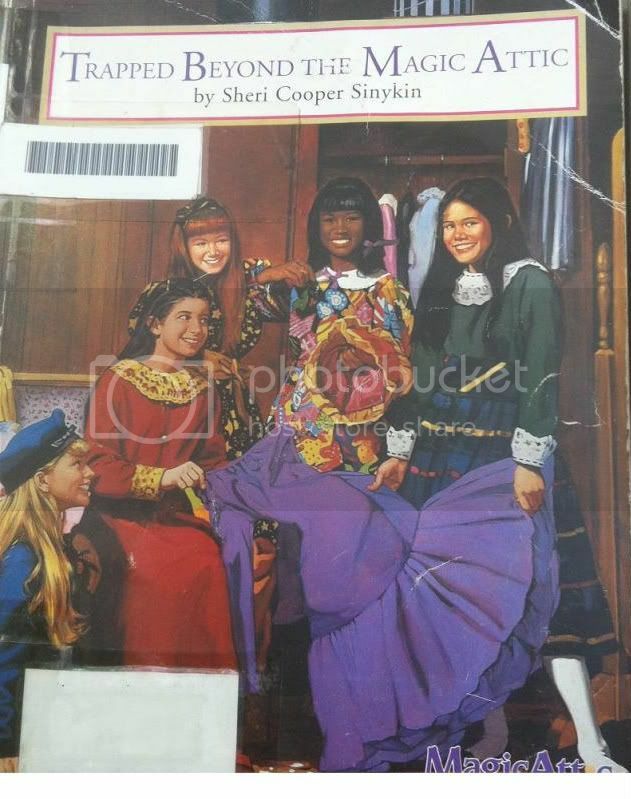 Let's zoom in on this one: Trapped Beyond the Magic Attic by Sheri Cooper Sinykin. Wow. What's up with those girls? They look very poised... as if they'd like to get in a fight over that one-armed purple dress, but they're far too polite. This is actually one of the "newest" books in the lot, released in paperback in 1998, but its' ratty condition and abysmal circulation rate mean that I feel comfortable weeding this one. How's your weeding going this week? Annette, me too, although I am proceeding slowly and with caution right now. I want to win over my new co-workers by focusing on making just a few things at a time look great. When they see how good it looks, that'll build trust. Beth, I know what you mean. Panky in the Saddle... just doesn't sound right to me. Yes, it's very sad :( I keep saying we could double our collection if they would just give us more shelves. We have the floor space. Our patrons would even donate more shelves! But alas the answer from up above is no :( We call ourselves the step-child branch. Aw, drat. I hear that's the new trend... less books, more meeting room space, more play space, etc.